How is activated charcoal used to whiten teeth? How about other natural teeth-whitening options? Best charcoal toothpastes: What products should I try? Activated charcoal is a more porous type of charcoal with a very large surface area that binds easily to many toxins. Originally used as a treatment for poisoning, activated charcoal has recently become popular as an all-natural remedy for teeth whitening. Charcoal removes stains via abrasion, which can also compromise tooth enamel. Use activated charcoal on your teeth sparingly, and seek out dental whiteners for more stubborn stains. Some people don’t want to use at-home bleaching treatments to whiten their teeth, either because of heightened sensitivity or a commitment to non-chemical products. In many of these cases, consumers turn to natural options like charcoal in the hopes of achieving results. As such, activated charcoal has become one of the newest popular natural remedies for whitening your teeth at home. Let’s take a look at what activated charcoal is, how it whitens teeth, and the side effects you should know about. We’ll also explain how to brush your teeth with plain charcoal and highlight a few of the most popular activated charcoal toothpastes available. Charcoal is the carbon and ash residue produced by slowly burning a material, often wood, in a no- or low-oxygen environment until water and other vaporous substances have been removed. Activated charcoal is processed at very high temperatures, changing its internal structure, reducing the size of its pores, increasing its surface area, and making it more porous. You may associate charcoal largely with grilling, but it actually has several health applications. Because of its large surface area, activated charcoal binds to a wide range of drugs and toxins, which is why it’s been used to treat ingested poison for more than 150 years. Activated charcoal also has other uses due to its ability to bind to toxins, such as acting as the primary ingredient in numerous water filters. Anecdotally, some individuals swear that brushing their teeth with activated charcoal lightens them naturally, sometimes achieving results in as little as one use. The idea is that the charcoal binds to toxins in your teeth and gums and removes them, taking away the stains caused by them in the process. However, toxins don’t accumulate significantly in saliva or in your mouth, and a thorough brushing and rinse — with or without charcoal toothpaste — will usually get rid of any bacteria and debris. In actuality, there are two methods to remove stains from the teeth: bleaching and mild abrasion. Charcoal itself does not contain chemical bleaching agents, at least not when used by itself, so it removes stains by mildly scouring the surface of the teeth instead. “Charcoal toothpaste works by scrubbing away exterior stains, also called extrinsic stains. These are stains that come about from using coffee, wine and tobacco on a regular basis,” explains Dr. Benjamin A. Lawlor, DDS, of Maine Cosmetic Dentistry. >> Learn more about the best teeth whitening products including kits, whitening strips, toothpastes, and more. If you’re using plain activated charcoal — usually purchased in capsule form from the health food store — there are two main ways you can use it to brush your teeth. The first is to wet your toothbrush, break open the capsule, dump the charcoal powder straight onto your toothbrush, and proceed with gently brushing your teeth. The second is to mix the charcoal powder with water in a bowl or other container to form a paste. You can either dab it onto your teeth using your finger, or gently apply it using a toothbrush. In both cases, leave the charcoal on for a few minutes so it can bind to the stains, and then rinse your mouth out completely until no black residue is visible. There are also many toothpastes and other products commercially available that include activated charcoal as an ingredient. These you can use to brush your teeth as usual. However you apply the activated charcoal, be careful not to brush too hard. Looking for an alternative to activated charcoal teeth whitening? 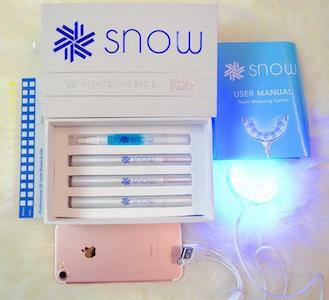 Snow offers an affordable at-home teeth whitening system that is highly rated by our visitors. Because of the lack of comprehensive scientific studies (see more below), the potential side effects of whitening your teeth with activated charcoal aren’t completely known. However, overzealous application can definitely damage your teeth’s enamel and gums due to the abrasive nature of charcoal, and charcoal residue can also get stuck in between your teeth, causing discomfort and other issues. Dr. Lawlor recommends using a charcoal toothpaste no more than once a week for this reason, and says that in-office whitening is the best method for lightening stubborn stains. Plain charcoal is also very messy to apply, especially if you’re using it in its powder form. If you decide to experiment with activated charcoal, be careful while breaking the capsules open, and always do it over a surface that can be easily cleaned, such as the bathroom counter. Also be careful of using white towels or wearing light-colored clothes around charcoal, as the black powder can cause stains on fabrics. >> Learn more about the causes of white spots on your teeth, and how they can be treated. Before-and-after Pinterest photos may claim that activated charcoal works, but it’s largely in the eye of the beholder. There are many natural methods that supposedly whiten the teeth. The best evidence for natural whitening is found with baking soda and hydrogen peroxide, which can be used separately or together. For example, one study found that a toothpaste containing both hydrogen peroxide and baking soda “significantly decreased” yellow discoloration of teeth. You can brush your teeth with either hydrogen peroxide or baking soda alone dissolved in water, or combine the two to make an extra potent toothpaste. Only do this a couple times a week, though, so you don’t erode your tooth enamel through overuse. Other methods to naturally whiten that have not been proven include oil pulling, apple cider vinegar, certain fruits such as strawberries and pineapples, and kaolin clay. If you’d still like to try whitening your teeth with activated charcoal, here are some of the best reviewed toothpastes on the market right now. Again, only use this toothpaste once a week to avoid thinning your tooth enamel. With more than 1,400 five-star reviews on Amazon, Twin Lotus is one of the most well-known names in the growing charcoal toothpaste market. The toothpaste’s triple-action formula kills bad breath, removes bacteria, and whitens teeth all at the same time. Some like the minty flavor (a result of the herbal extract), while others weren’t a fan. 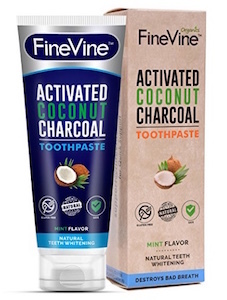 As the name suggests, FineVine combines two ingredients that are supposed to naturally whiten your teeth: activated charcoal and coconut oil (plus peppermint oil and baking soda). Completely vegan, the toothpaste is formulated without chemicals, artificial colors and flavors, fluoride, hydrogen peroxide, SLS or GMOs, making it safe for sensitive teeth. 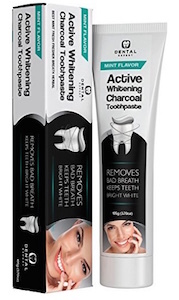 Dental Expert combines activated charcoal with three oils (coconut, peppermint, and tea tree) for a whitening toothpaste that also tastes and smells minty fresh. The toothpaste is free of toxic ingredients, fluoride, and bleach, and doesn’t contain artificial colors or chemicals. If you’ve tried natural remedies and your pearly whites are still looking stained, it might be time to look into professional teeth whitening options instead. If you’re ready to take the next step in whitening your teeth, we can help you find a qualified cosmetic dentist in your area.